Vitamin B consists of eight essential nutrients, which are used by most of the body’s sixty trillion cells. These eight vitamins work best together. Therefore, even if someone is lacking in any one of these eight vitamins, it would still be best to take the whole vitamin B complex in addition to the specific nutrient that is lacking. Deficiency symptoms can manifest as a range of physical, psychological and emotional issues including: anxiety, stress, depression, poor concentration, migraines, headaches and probably most common, a lack of energy. The B vitamins are critical in the conversion of food into energy, which is why they are so essential and therefore should always be considered as a first port of call where one is suffering from low energy and low moods. The B vitamins are often referred to as the ‘anti-stress vitamins’ because of their ability to increase our capacity to cope with the demands of modern life. B vitamins are also essential as part of a good recovery programme after a period of illness or when we have been ‘overtrading’ i.e. exceeding our capacity either physically, mentally or both. • People who consume a lot of sugar may be deficient in B1, which helps to regulate the body’s use of sugar and carbohydrates. B1 is also important in brain function and essential for healthy skin. It is depleted by the consumption of too much tea, coffee and alcohol and a number of drugs can also hinder its absorption. • B2 is important for the nervous system and a healthy immune system. It also helps to break down carbohydrates, fats and proteins. Those consuming a high protein diet may benefit from extra B2. Alcohol and some drugs, especially antibiotics, can interfere with its absorption. Those who exercise frequently may need extra B2 to help control acidity levels as acid production increases when muscles work harder. • B3 can help with a range of mental health issues (see the work of Abraham Hoffer and Carl Pfeiffer – and the exciting work they did with schizophrenia). B3 is beneficial in helping to manage high cholesterol and the health of the gastrointestinal system. It also helps to break down fats and can, through the increased oxygenation it facilitates, support blood flow to the hands and feet. It too is depleted by alcohol and some drugs. Protein deficiency can also impact on vitamin B3 levels. • B5 is required for a healthy immune system. As it supports the adrenal glands, it is helpful for those with high stress levels. It helps to maintain the digestive system, nervous system, bones and joints. It is crucial in the balancing of blood sugar levels. Vitamin B5 is also depleted by alcohol and antibiotics. • B6 helps the body to utilize protein (as does B12 and folic acid). It is useful for hormone balance, mood, memory and concentration. Those suffering with depression are often deficient in vitamin B6, which is why it can be useful in the treatment of such conditions. Like all of this family of vitamins, B6 is depleted by alcohol, coffee, some drugs, smoking and even dieting can impact on its levels. • B12 helps to break down protein, fats and carbohydrates. It supports the brain in the countless tasks it performs, impacting on mood, memory, concentration and focus. Vitamin B12 is also pivotal in liver function and immune system function. It may be lacking in those following a vegan diet, as its main sources are animal products – although there are now a number of fortified food options that can help address this form of deficiency. It is often depleted by stress and illness. • Biotin (B7) helps to break down carbohydrates. It is important for fat metabolism, muscle function, healthy hair and skin, the nervous system, energy levels and mental health. It is depleted by various drugs and is compromised by rancid fat. • Folic acid helps produce red blood cells and supports healthy cell division. It aids the digestion, liver and the breakdown of protein. It is helpful for good circulation, the joints, memory and mental health. It is depleted by alcohol, smoking and stress. B12 deficiency can cause a deficiency in folic acid. • Signs of B vitamin deficiency can be poor digestion, sore tongue, cracked lips, poor skin, lack of energy and impaired vision. • Some of the best food sources for B vitamins are: vegetables (especially dark green leafy vegetables), watercress, mushrooms, alfalfa, whole grains, beans, lentils, fish, eggs, dairy, fortified cereals and fortified milk (e.g. soya and rice) and poultry. Also, various fruits such as, papayas, oranges, bananas, dried apricots and cantaloupe – this is not a definitive list. 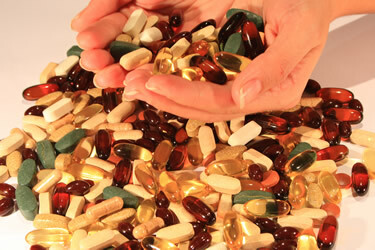 Taking supplements without looking at the whole of your dietary profile is not wise. This is why it is best to get advice from someone who is appropriately qualified in nutrition, as there is a lot of contradictory information out there and if you are not careful, you’ll just end up buying every supplement you see advertised. Good health requires adequate hydration, deep restorative sleep, regular exercise, a good balanced diet, positive thinking and regular introspection/relaxation. Don’t forget to have fun too!